Back in February we first saw the Joby Gorillapod. It is an extremely versatile tripod that can wrap around damn near anything. Joby has answered the requests of the people and released a bigger, better version of the Gorillapod designed for small camcorders and SLR cameras. 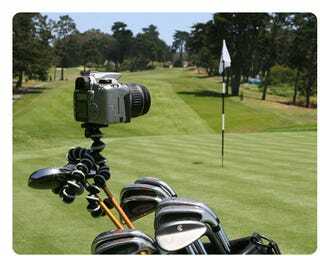 The Gorillapod SLR uses the standard 1/4-inch screw and can hold up to 2.5 pounds of gadgety goodness. It retails for $49.95, but they are offering a coupon code for the Gizmodo readers. Enter the code, gizmodoSLR, and receive $5 off your Gorillapod SLR purchase. Edit: There was some issues with the coupon code earlier today, but all is well now. Thanks for the patience.